Pre-packaged with DOSBox. Bundled with Menzoberranzan. For the GOG.com version, edit dosbox_dhack_single.conf and remove the lines between the first and second instances of cls to remove the reminder about copy protection being cracked. Seed and game difficulty settings are stored in SEED.TXT. High scores are stored in HISCORE.DAT; high scores can be reset using <path-to-game>\newscore.exe. Saved maps are stored in <path-to-game>\MAPS.TXT. Set up DOSBox printer support. 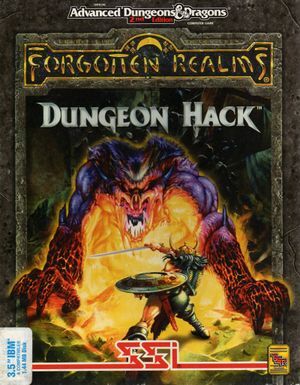 For the GOG.com version the file to edit is dosbox_dhack.conf in the installation folder. Automaps can now be printed in-game.